I always find it fitting that Corn Wagon's birthday happens to fall near Thanksgiving. After all, the annual PJ Party's purpose is to show our love and gratitude for all of you wonderful friends who have supported the shop over the years. There's nothing like opening our doors early each year to a flood of familiar faces! It's an honor knowing each of you. 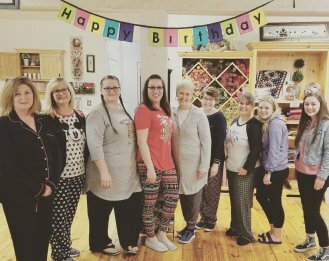 Thank you for braving the early morning chill (we're also grateful for hot chocolate) and the long lines to celebrate 19 years of happy quilting with us! Looking forward to some relaxing handwork to fill your Thanksgiving Holiday? 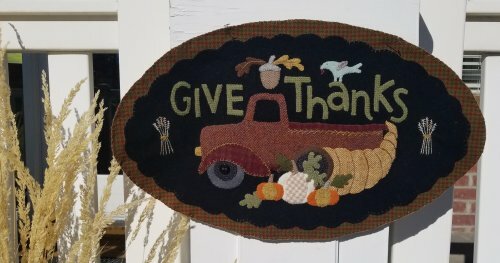 We have lots of wonderful wool applique kits here at the shop including Buttermilk Basin's Vintage Truck for November. This 12.5" x 20.5" table mat hints of a plentiful harvest using rich wools hand-dyed by Marianne Michaels. We wish you all a joyful week of giving thanks! There's something about those roots and that checkered border that have me rushing to pull out my rug hooking frame! Deep Roots was designed by Threads that Bind and hooked by Marianne Michaels. 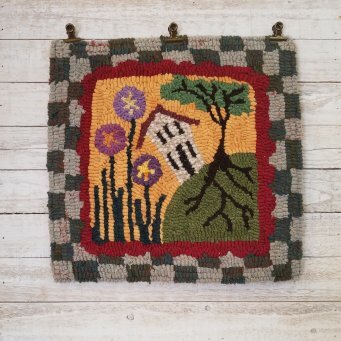 We have kits for this and other primitive rug hooking designs here at the shop. 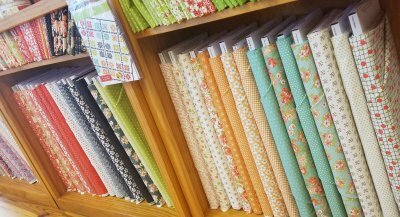 Did you know we also carry the linen backing by the yard? And hooks! I also want to point out Marianne's clever idea for displaying wool projects. White washed wood slats with vintage clips make it easy to change with the seasons! She's always on the lookout for clever displays and found this one at a local discount store but wouldn't it be easy to DIY?! Brilliant! I thought I'd take a moment to share our progress on the Christmas Figs Block-of-the-month here at the Corn Wagon. The first 6 blocks have been so fun to put together! That feathered star block had me shaking in my furry slippers (that's what you wear when you sew too, right?) but I took my time and it came out wonderfully. 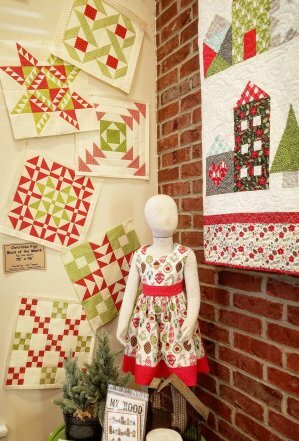 We're looking forward to our next gathering this Saturday here at the shop where we'll learn two more blocks, bringing us a quarter of the way through this timeless Christmas quilt. Although this BOM is full we do have the Christmas Figs pattern book and many pieces of the fabric collection available! Also, from Fig Tree we just received the Farmhouse II Collection! We have yardage and pre-cuts of this long awaited collection. We're dying to show you what Julie Hancock is working on... it's not quite ready yet but it's soooo good! Here in be-UTAH-ful Utah, we tend to look to the mountains. For signs of spring, summer, fall and now winter. For inspiration, revelation, exhileration... for our livelihood, for our enjoyment. We currently have high hopes for lots of snow because, well, SKI UTAH! And heaven knows we need the water here in our high desert. For me personally, the mountains have become a symbol of stability and endurance. 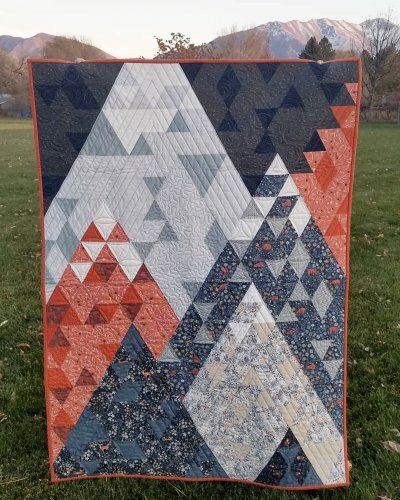 The Mountains quilt is available as a free download at liveartgalleryfabrics.com They have SO many great free patterns, you may get distracted. Don't say I didn't warn you! I made this quilt for my new nephew whose middle name is Ridge and whose family loves the mountains as much as I do. At 36" x 50" it makes a perfect baby blanket, child's throw or wall hanging. Our kits include fabrics from the Bear with Me collection from Dear Stella mixed with a few Cotton + Steel basics and even a batik! Machine quilting by Emily Herrick here at the shop makes for a modern finish. 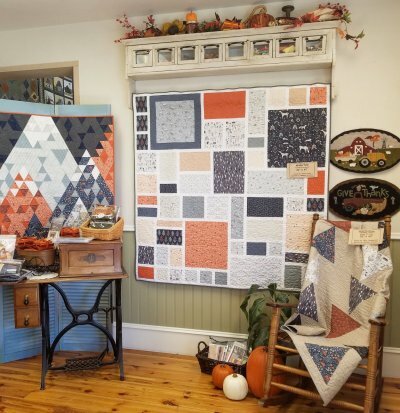 Along with the Mountain quilt we have two more mountain themed quilts that will make you want to snuggle up as autumn turns to winter here in the Wasatch. Winterfold (center) made by Stacey Giles brings folk-style woodland animals in a rust and grey winter color scheme to the Modern Rose Garden pattern by Carolina Patchwork. Hi"bear"nate is another fun free pattern from liveartgalleryfabrics.com (Did I tell you they are great?!) Pieced by Chris Chamberlain this pattern lends itself well to featuring favorite prints. Machine quilting by Ramona Sorensen here at the shop! Monday, November 19th - 25% off NOTIONS & BATTING! Don't forget to support local businesses with your holiday shopping. Stay tuned for discounts and specials to be announced for our Small Business Saturday Sale! It's a great time to pick up stocking stuffers, gift cards and more for your quilty friends!